In early April 1938, the Nazis, ever mindful of positive propaganda and cementing their grip on the European political agenda, sent the brand new Kraft Durch Freude liner the Wilhelm Gustloff on a journey to England so expats living in the British Isles could vote in the plebiscite approving the recent annexation of Austria. The exercise was stage managed to perfection and it gave the Nazis the opportunity to present themselves in a positive light to a sceptical British media. The ship arrived at the English port of Tilbury some miles east of London and embarked well over a thousand people preparing to vote in the plebiscite. British newspapermen swarmed over the ship and a large number of images were taken of the floating electorate during the whole democratic process. Press photos show polling booths, attractive voters and a number of images of the ballot being counted. One newspaper had a snapper in the air to picture the ship as it sailed down the River Thames and out into the open sea where the vote took place in international waters outside the three-mile limit. One or two papers saw an opportunity for sales and printed bills in German encouraging new readers and among them were the occasional dissenters carrying placards yelling “Germans vote no! For peace, freedom and prosperity.” The world war that followed would destroy any hope of those aims being achieved in the immediate future. 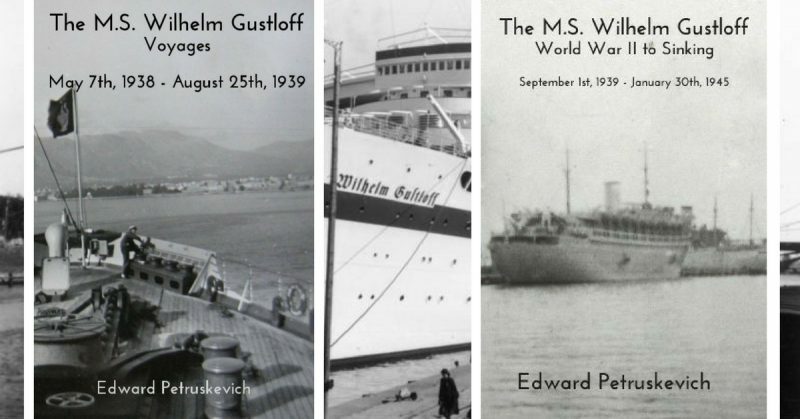 This is just one story from this excellent series of books collated by the historian Edward Petruskevich, the curator of the Wilhelm Gustloff Museum. 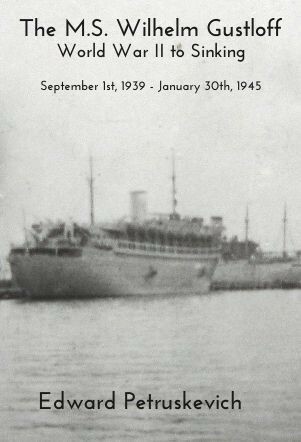 His work has moved on to the working life of the ship before and during World War II and it’s tragic end on 30th January 1945 when the ship was sunk by a Soviet submarine taking over nine thousand people to a watery grave. The sinking remains the worst maritime disaster in history but rarely receives much attention. It was wartime, the Germans were the enemy and these things happen. The sinking is an event often overshadowed by the Titanic, or even the Lusitania sunk in 1915.The disaster that befell the hapless Lancastria during the British evacuation of France in 1940 is another case in point. Nobody really knows for certain how many men were aboard her when the Luftwaffe caught up with her but the best guess is several thousand. These parallels should put the sinking of the Wilhelm Gustloff into context for the human tragedy it undoubtedly was. But with thousands of Allied soldiers on the ground in Europe fighting against a tenacious and ruthless enemy, there was little room for sentiment for the deaths of people retreating from lands the Nazis had conquered. Concentration camps were being discovered, confirming the full horror of Nazim. The dead of the Wilhelm Gustloff were just more casualties of war. I’m not of a mind to delve too deeply into the rights and wrongs of the disaster but am happy to read about it and acknowledge the innocents on board, the children and the elderly, attempting to escape the Soviet advance into East Prussia and occupied Poland. I have said something similar before that the tragic death of a ship should not obscure the colour of its life. This applies to warships, the great liners or just about any rusty old tub we keep in mind. Ships are communities and almost like living things, they are celebrated and commemorated as if their loss was like the death of a loved one. I am sure this applied to the survivors of the Wilhelm Gustloff and their descendants because it was always the case in my family with the loss of the Arandora Star in 1940. 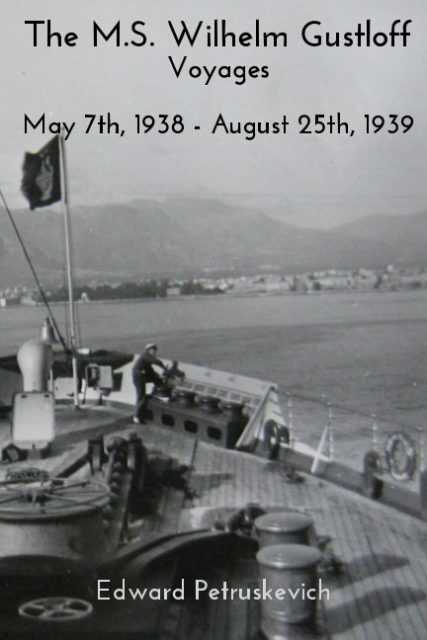 She had been the standout posting of my engineer grandfather’s Merchant Navy career when he sailed with the Blue Star Line and the manner of her sinking by a U-Boat as she took interned Italians and Germans to Canada is another of those tragedies that shouldn’t be forgotten. Some of my grandfather’s best friends when down with her, including the captain, who knew his duty. I digress, but the Wilhelm Gustloff was a lovely ship and the author relates her story and shares a mass of ephemera from her with great passion and care. His account of the post war period when the wreck was used and abused is particularly poignant and I continue to admire his determination and enthusiasm to see the project through. Perhaps a big name publisher might have shoehorned the material from what ended up as four books into a single volume. I think something would have been lost had they done so. By keeping his hand on the wheel the author has ensured his vision has been seen through from first to last. This is his baby. These two volumes have been sitting in my in-tray for a while for reasons mentioned previously and I am glad to have finally been able to write a review. Eddie Petruskevich is the sort of author I admire. He knows precisely what he wants to achieve and does not compromise. These books should be marked out as a standard-bearer for self-publishers. We all know not every book will be brilliant, but in this case the author has proven himself to be quite competent and totally attuned to what he is doing. The books read well and the mass of archive stuff is attractive and fascinating. There seems little doubt in my mind that had she survived the Wilhelm Gustloff would have been taken as a prize and renamed by one of the victorious Allies. Her tragic demise ruled out that particular humiliation. Perhaps the events of January 1945 allowed the ship to keep her dignity for a while, but regardless of all her earlier adventures, that night when Captain Alexander Marinesko of the S-13 got her in his sights has fixed the ship’s place in history forever. He was doing his job and all power to him, but the manner of the death will always diminish the light of a life. Edward Petruskevich has attempted to lift the veil smothering the Wilhelm Gustloff and he should be congratulated for a job well done.